Way back last fall, it seemed like a great idea to join a local gourmet chicken consortium starting up (grouping of import expenses reduced costs significantly). 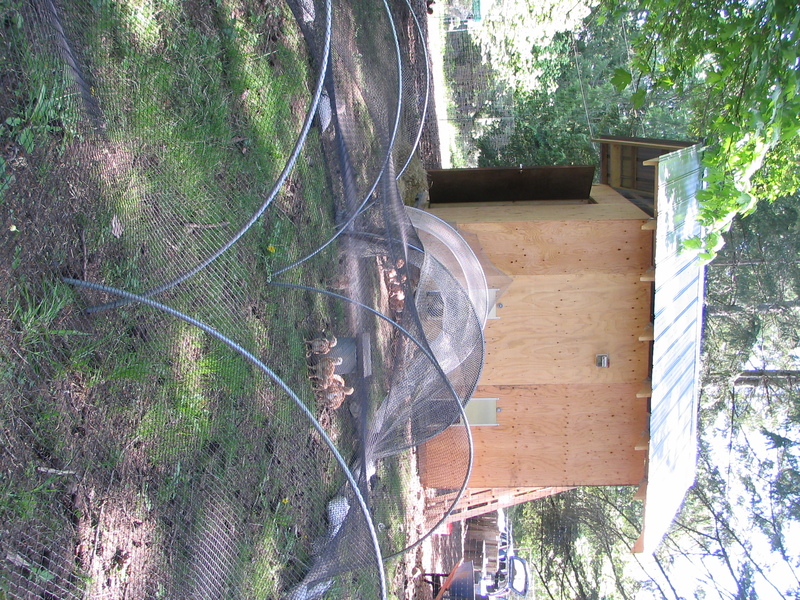 In late April, with chicks due to arrive in a couple of weeks, Ron and I built a new chicken coop. Out of our 50 chicks, we’ve lost one bird so far due to trampling. During a heavy rain, the ground fault breaker on the heat lamp tripped so they huddled extra closely. Now the flock has feathered out enough that I turn off the light during the day and shoo them into their outdoor pen, where I’ve relocated their feed. It also has a few blades of grass and the odd bug for those plucky chickens who have not completely lost their instinct to scratch. We’ll start giving them freshly cut grass from the yard, to simulate the pastured poultry better. But, in a few more weeks, when they’re significantly bigger, we’ll just cut them loose in the big pen where they can free-range the tall grass by themselves. We’ll probably start taking orders for them in June. 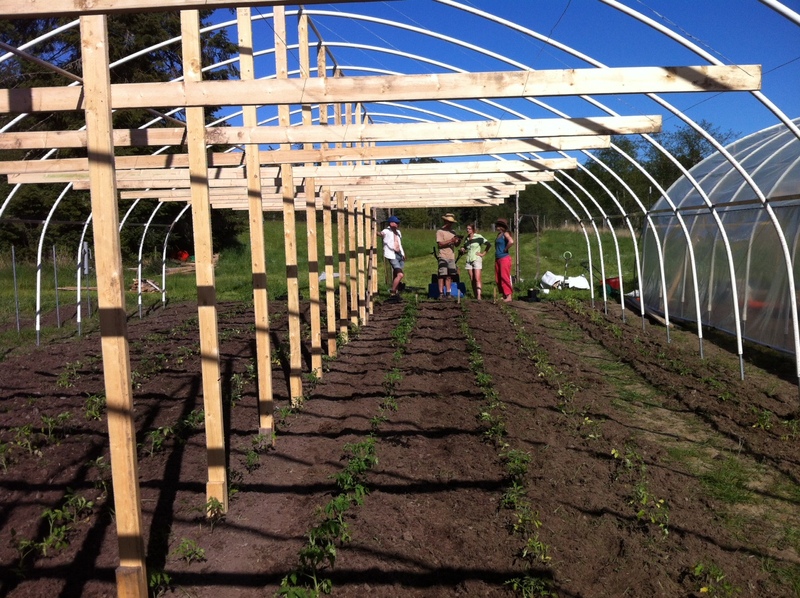 Yesterday, a bunch of Vincent’s farm-friends helped him plant a quarter acre of potatoes. Vincent is from New Brunswick and is passionate about potatoes and pigs. 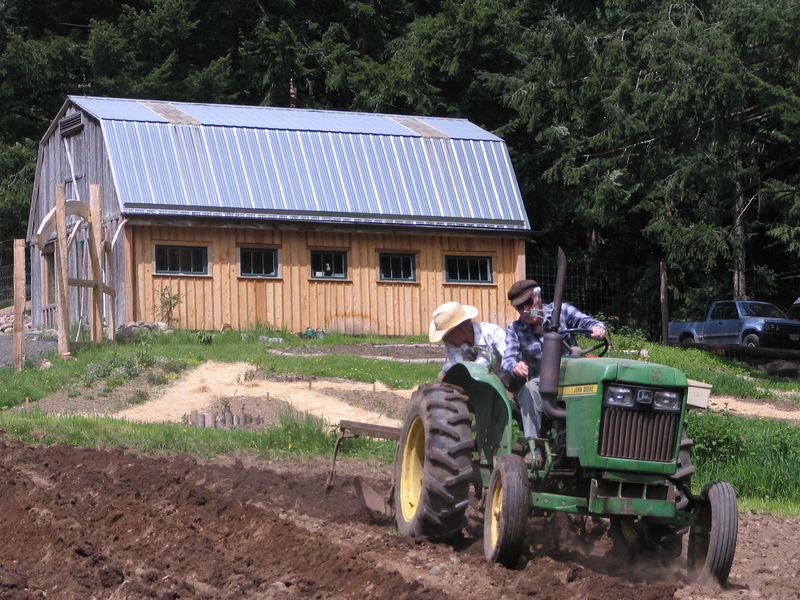 He rustled up 96ish Roy Almont (who still lives on the farm he used to own) to plow the furrows we used to drop the potatoes into. He did a nice job considering the variable slope he was on. It was a fun time.